This page contains information about WiDs-related student research projects. 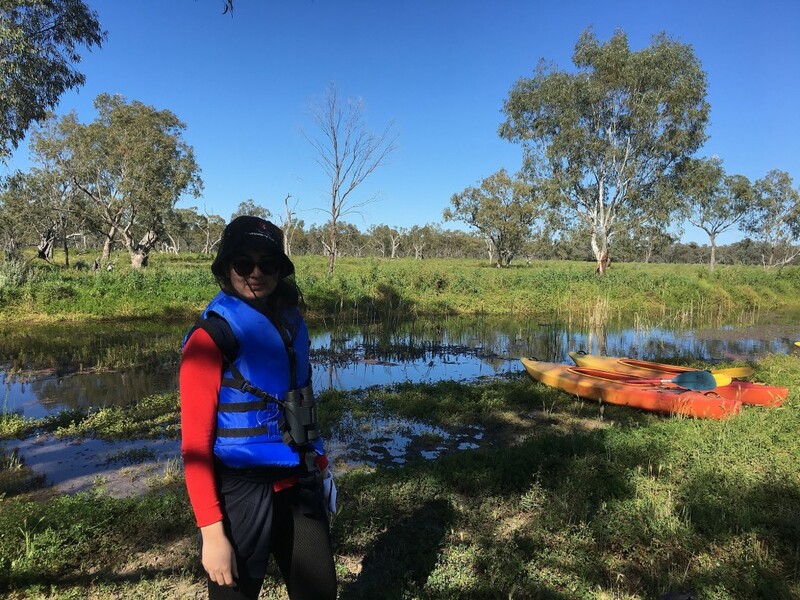 Neda Yousefi in the Macquarie Marshes, NSW, Australia. Biography: I am a PhD candidate in the Department of Environmental Sciences at Macquarie University, Sydney. I completed a Master of Research in Iran focused on estimating the geometric parameters of stable alluvial channels. The main focus of my PhD research is also on alluvial channels and their changes. Research topic: Assessing and modelling impacts of erosion and sedimentation in unstable alluvial channels. Flooding in the Macquarie Marshes, NSW, Australia. Project overview: My PhD research aims to assess and model key processes of erosion and sediment deposition in unstable alluvial channels, and to link these processes to long-term impacts to help define thresholds for bank instability leading to avulsion (the process of channel relocation on a floodplain). 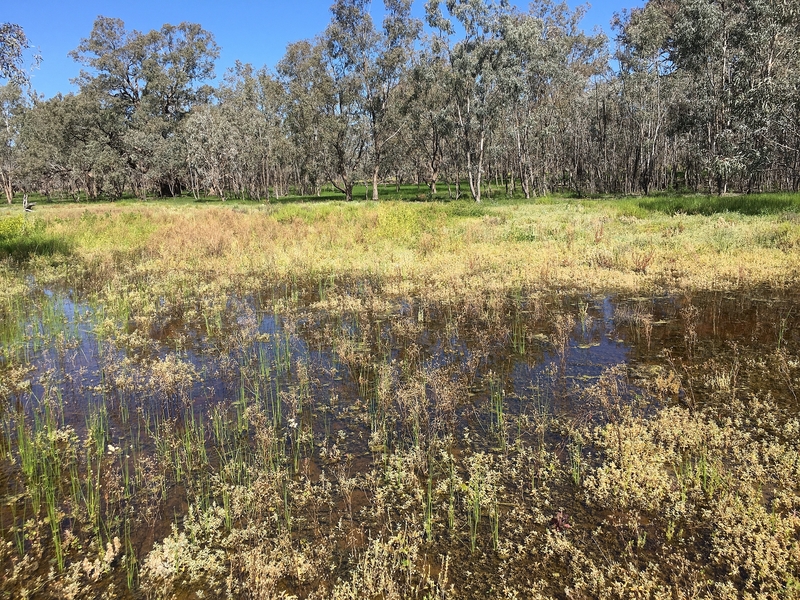 Field sites in the Macquarie Marshes, one of Australia’s largest floodplain wetland systems, will be assessed according to their geomorphology and condition relative to other comparable sites. Site assessment will be conducted through the use of LIDAR elevation data and on-ground survey information. Using a combination of landscape evolution and morphodynamic modelling approaches, a number of scenarios will be tested to ascertain whether channel biophysical attributes, cross section metrics, and inflow event sizes affect the propensity for avulsion in the system. A shallow alluvial channel in the Macquarie Marshes, NSW, Australia. Supervisors and key collaborators: Dr Tim Ralph (Macquarie University), Dr Michael Grenfell (University of the Western Cape), Dr Paul Hesse (Macquarie University), Dr Michael Chang (Macquarie University). 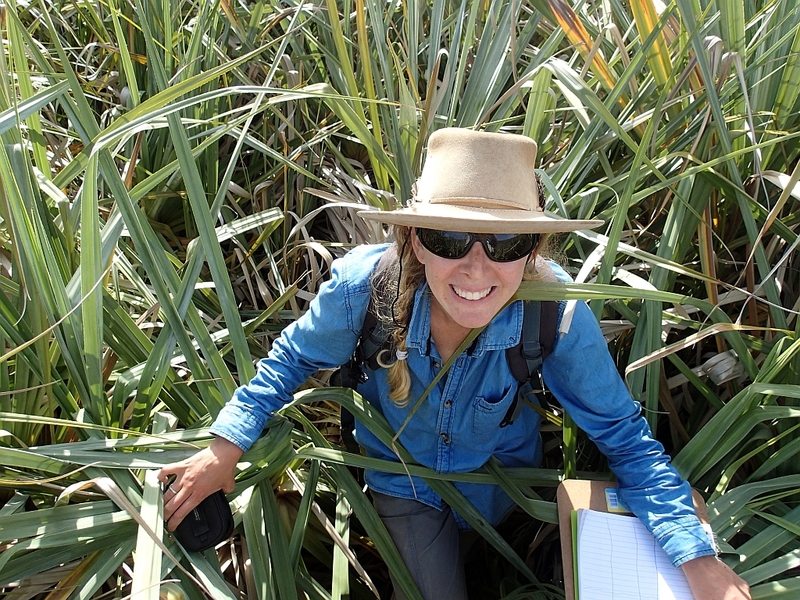 Pippa Schlegel conducting vegetation sampling in the Krom River wetlands, Eastern Cape, South Africa. Biography: I am currently an MSc candidate in the Department of Geography at Rhodes University, South Africa. I have always been passionate about biodiversity and conservation. My goal is to work within the sphere of wetland ecology, management and restoration. My MSc research thesis reflects my passion in wetland functioning, conservation and management. 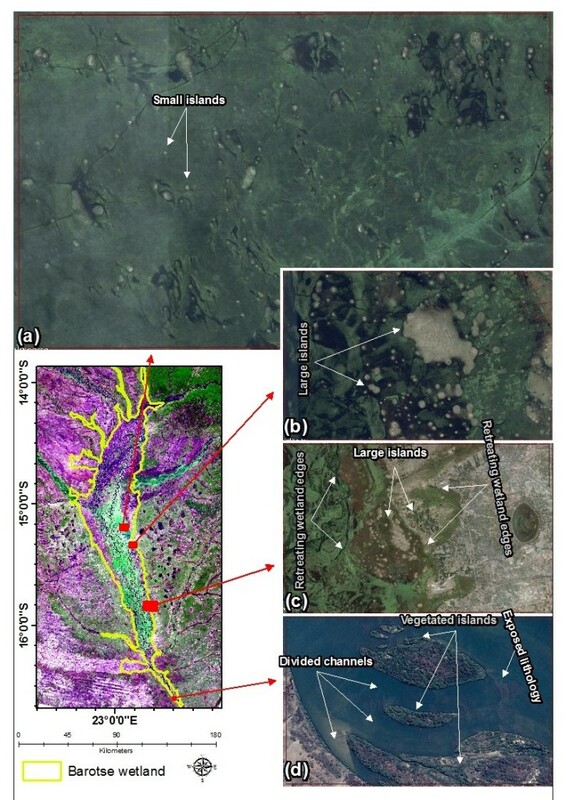 Research topic: Spatial variation in modelled hydrodynamic characteristics associated with valley confinement in the Krom River wetland: implications for the initiation of erosional gullies. Palmiet (Prionium serratum) wetland, Krom River, Eastern Cape, South Africa. Project overview: Gully erosion is a widespread phenomenon occurring throughout South Africa. Wetlands are particularly affected, with an estimated 50% of South Africa’s wetlands having been degraded. Discourse has largely attributed gully formation within wetlands as having anthropogenic origins. However, gully erosion has been identified in a range of environmental settings from heavily modified farm land to near pristine land in nature reserves. As such it has been suggested that gully erosion in wetlands may be a natural phenomenon linked to geomorphic thresholds. My research focuses on the change in hydraulic properties (velocity, depth and stream power) of surface flow as a broad valley is confined in a downstream direction by a combination of large impinging alluvial fans that coincides with resistant bedrock lithology. There has been very little research related to hydrodynamic factors that may be associated with gully formation in wetlands. Such research would be very useful as a way to reveal the relative importance of factors that may contribute to erosion in wetlands, using the Krom River wetland as a case study. 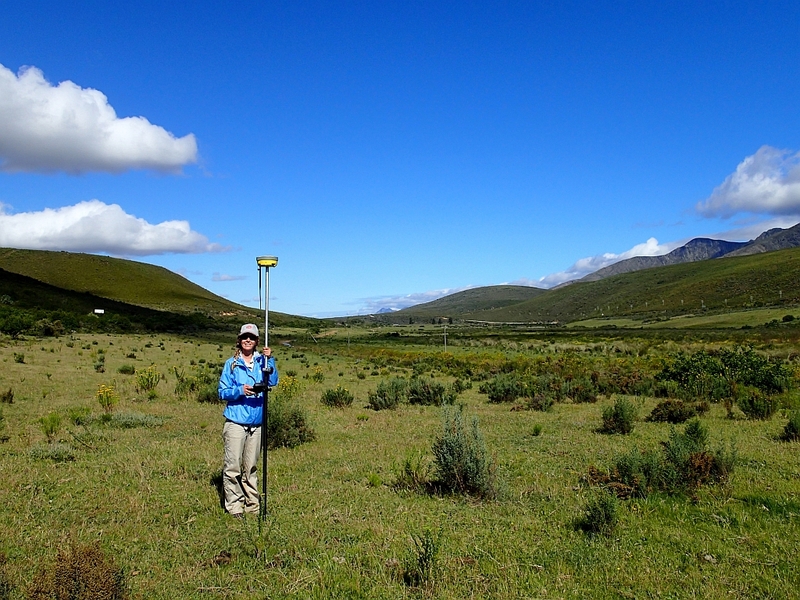 Pippa Schlegel conducting a topographic survey using a differential GPS. Supervisors and key collaborators: Professor Fred Ellery (Rhodes University), Dr Michael Grenfell (University of the Western Cape), Dr S. Pulley. Biography: I am a PhD candidate in the Institute for Water Research (IWR) at Rhodes University. My research focuses on the geomorphic origin of some of Africa’s large and inaccessible wetlands. The study uses Geographic Information Sciences (GIS) desktop methodology and Earth Observation (EO) datasets. Research topic: A classification of large wetlands in Africa’s elevated drylands based on their formation and structure. 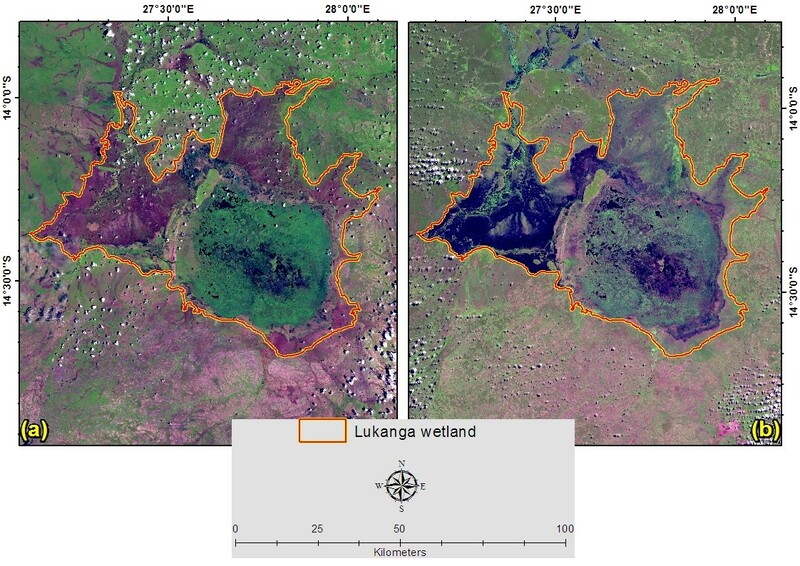 Mosaics of LandsatLook images showing the saturation condition of Lukanga wetland in central Zambia on 18 and 27 November 2013 (a; early wet season), and 20 and 27 April 2014 (b; late wet season). Project overview: My project aims to classify large wetlands in Africa’s elevated drylands based on factors that determine their formation and shape their structure and hydrological functioning. There is a lack of knowledge and understanding of large wetland’s geomorphic origin, structure and hydrological functioning in Africa’s elevated drylands. This knowledge gap is exacerbated by challenges such as the continent’s aridity, topographic anomalies, and the size and inaccessibility of these wetlands. Since potential evaporation greatly exceeds precipitation and channels are in a long-state of incision as a result of the topographic anomalies, one would expect these conditions to militate against wetland formation. Yet, the continent host some of the world largest wetlands. Google Earth images showing islands, channels and retreating wetland edges within the Barotse wetland, western Zambia. Although there are models that have been developed in South Africa to explain the formation of wetlands and classification schemes that group wetlands into functional groups, most of these models and classification schemes cannot be adopted for these large wetlands. Therefore, the current study is designed to bridge the existing knowledge gap by providing an in-depth understanding of the geomorphic origin, structure, and hydrological functioning of large wetlands such as the Lufira, Kafue, Barotse, Lukanga, Bahi, Busanga, Wembere, Usangu, Luapula, and the Upper Zambezi wetlands. Supervisors and key collaborators: Professor Fred Ellery (Rhodes University), Dr Sukhmani Mantel (Rhodes University). 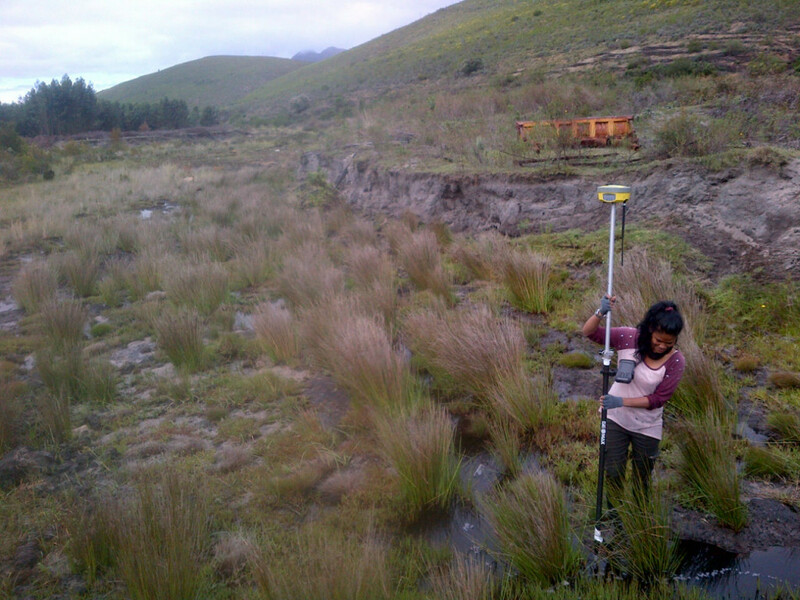 Afeefah Williams conducting a topographic survey of The Kromme wetland at the Krugersland Farm, South Africa. Biography: I am a Masters candidate in the Department of Earth Sciences at the University of the Western Cape. I have always been passionate about the environment and its preservation. During my down-time you’ll find me on the mountain, under a tree, or floating along the river, basically anywhere outdoors. Research topic: The hydrodynamic characteristics of erosional headcuts in Palmiet (Prionium serratum) wetlands along the Kromme River. 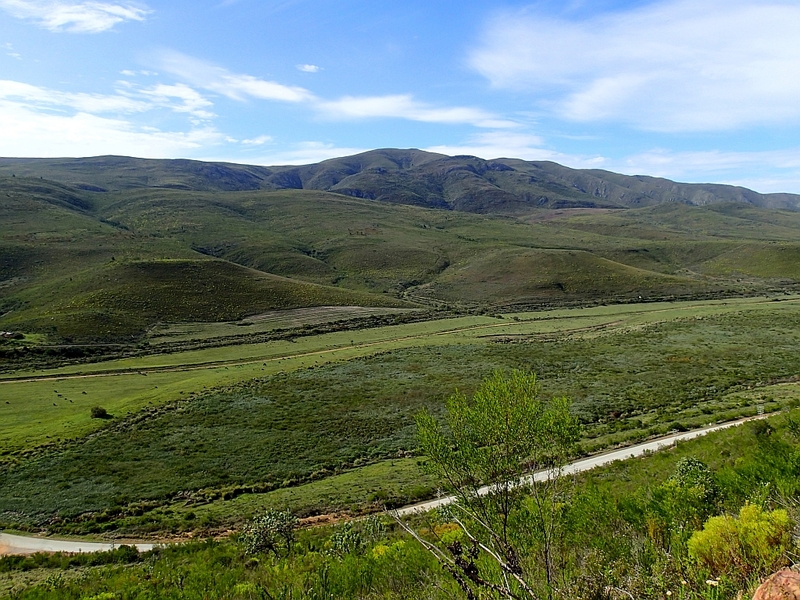 Project overview: My research project aims at advancing the understanding of processes surrounding the degradation of indigenous Palmiet wetlands in Eastern Cape, South Africa. The Kromme River wetland has been a site of extensive morphological degradation through headcut migration and recurring restoration intervention failure. My project investigates the relationship between headcut migration rate and both local and regional hydrodynamic controls. These controls include headcut dimensions, bed roughness, soil profile composition, and headcut watershed. It is hoped that in quantifying the effect of each of these mechanisms essential information on the process of headcut migration in varying environments will be provided. Additionally, the relationship between these factors will be used to evaluate the “Intensity and magnitude of impact of erosional features” assessment found in WET-Health for potential improvement. Afeefah Williams collecting headcut dimension data and measuring gully depth, South Africa. Furthermore, morphologically-based topographic data will be used as input data to construct a numerical hydrodynamic model using HEC-Ras. The model has the potential to simulate various scenarios (e.g. floods, restoration interventions) and predict the reaction of river morphology to each scenario. A case study on the change in NDVI of the wetland over the past decade will be done in order to quantify the effect headcut migration has had on the vegetation in the wetland. Understanding the relationship between these factors will provide necessary insights into the process of headcut migration, wetland restoration and management. 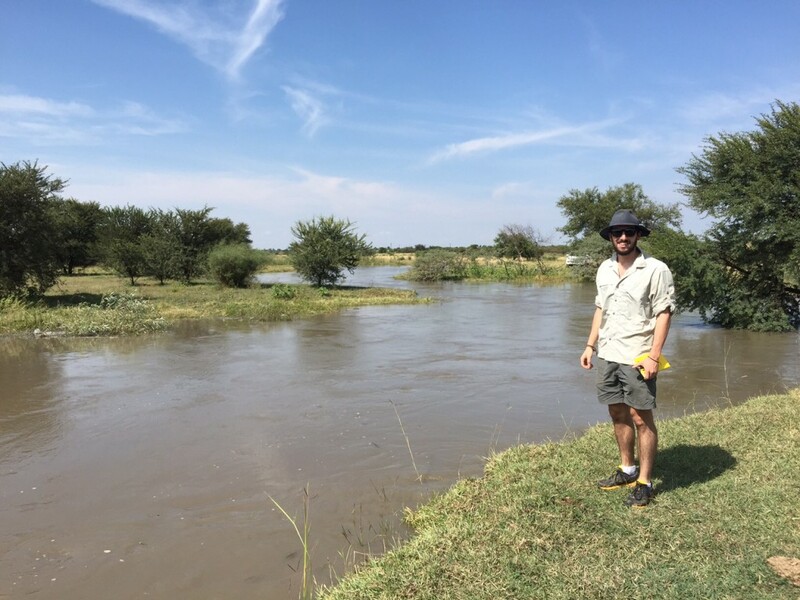 Zacc Larkin investigating the Tshwane River, South Africa. Photo by Tim Ralph. Biography: I am a PhD candidate in the Department of Environmental Sciences at Macquarie University, where I previously completed a Master of Research. My research focuses on processes of channel change and avulsion in rivers and wetlands in drylands, and I have worked in Australia, South Africa and Botswana. Research topic: Climatic variability and floodplain wetlands in drylands: form, functioning, and change. 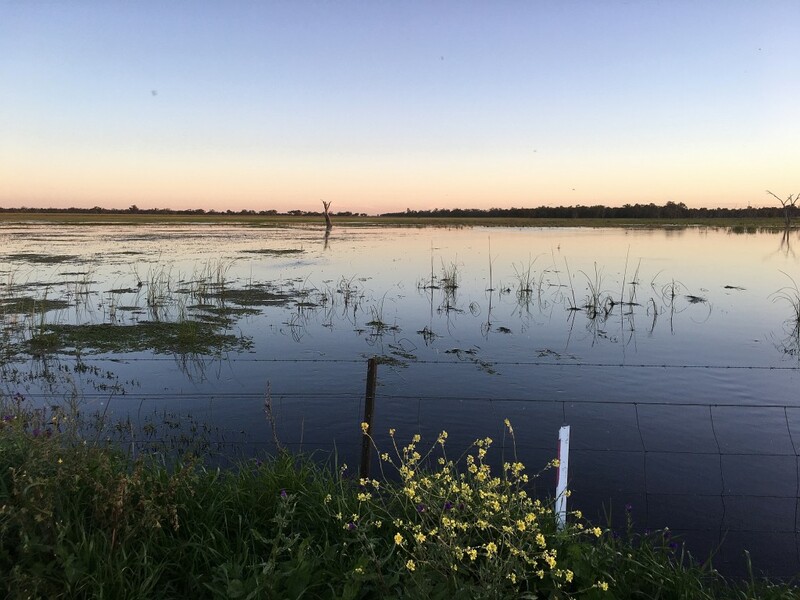 Project overview: My project investigates the influence that climatic and hydrological variability exerts on floodplain wetland characteristics and processes over a range of spatial and temporal scales. Spatial climate gradients exist in drylands from relatively wetter subhumid areas to the drier arid areas. Along this gradient is a continuum of floodplain wetland styles, from continuous systems that maintain sediment throughput in subhumid regions, to discontinuous systems that are characterised by sediment accumulation and channel breakdown in arid regions. My project will attempt to characterise and quantify the influence of variations in aridity on floodplain wetland geomorphology. 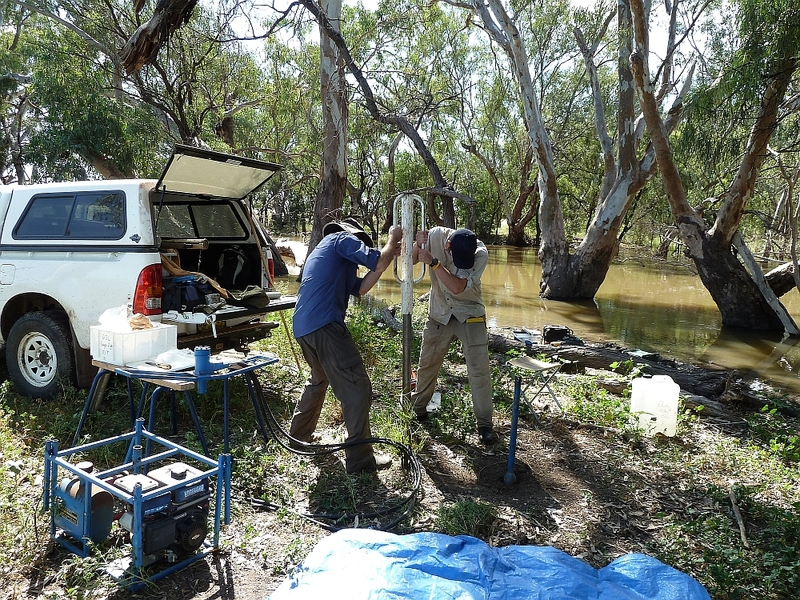 Zacc Larkin sampling sediment near the Macquarie River, Australia. Photo by Tim Ralph. In conjunction with this spatial continuum of floodplain wetland styles, many of these systems preserve evidence of ancient fluvial landforms that indicate significant Late Quaternary climatic/hydrological change (e.g. large abandoned palaeochannels, or high lake shorelines higher than current lake levels). My project will investigate the timing and magnitude of enhanced fluvial activity in two large semiarid alluvial fans: the Okavango Delta in northern Botswana, and the Warrego River Fan in eastern Australia. Studying these palaeo-fluvial features will provide an understanding of past climates, the landscape responses to these climatic conditions, and how they may change in the future (e.g. due to climate and land use change). Supervisors and key collaborators: Dr Tim Ralph (Macquarie University), Associate Professor Kirstie Fryirs (Macquarie University), Professor Stephen Tooth (Aberystwyth University), Professor Terence McCarthy (University of the Witwatersrand).